Fun Fact #1: Streep's performance in this film earned her golden globe and SAG nominations, but no corresponding oscar nod; this was one of the few high-profile snubs of her career (the only others were for The Hours and, to a lesser extent, The Manchurian Candidate). 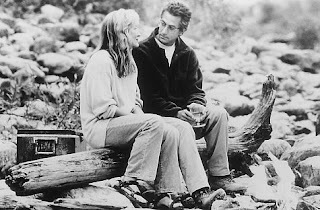 Fun Fact #2: This film was not the first time Streep had worked with David Strathairn (who plays her husband); he'd previously played one of Karen Silkwood's co-workers in Silkwood. Fun Fact #3: Carrie Fisher, who wrote Postcards from the Edge (Streep's last oscar nomination before The River Wild), served as an uncredited script doctor on River. Fun Fact #4: One day during filming, director Curtis Hanson encouraged Streep to film an additional scene at the end of the day despite her fatigue, and she reluctantly agreed, despite her reservations. Then, she nearly drowned after being thrown from her raft. After she was rescued from the water, she reportedly told Hanson: "In the future, when I say I can't do something, I think we should believe me" (Hanson agreed). 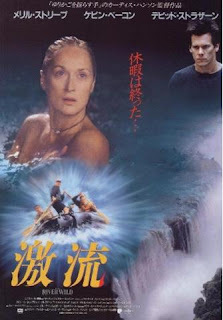 Film Review: This was an enjoyable flick, nothing too special, but lots of fun, thanks to impressive performances by Streep, Strathairn and Bacon (golden globe nominated), pretty scenery, and thrilling rafting sequences. The film starts off rather slow (before the rafting starts), but it picks up before too long. That I started watching it at 1am this morning and didn't feel the need to turn it off and go to sleep 'til it was done is testament to the film's watchability. 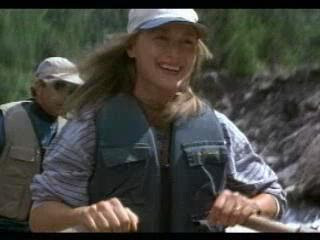 The story concerns 40ish wife, mother, and history teacher Gail Hartman (a rather weathered-looking Streep, who seemed no younger then than she does now, 13 years later) who takes her family on a whitewater rafting trip in an area where she used to be a guide. Gail is just a mild-mannered history teacher by day, but by weekend, she's a badass whitewater rafter. Her husband Tom (David Strathairn) is mild-mannered ALL the time; he's a workaholic architect who doesn't share her passion for the outdoors. Gail and Tom are estranged when the story begins - he works all the time, she feels neglected - but after Tom decides at the last minute to join Gail and their son, Roarke (Joseph Mazzello, of Jurassic Park fame) on a getaway for the weekend, the couple end up rebonding in a fight for their lives. 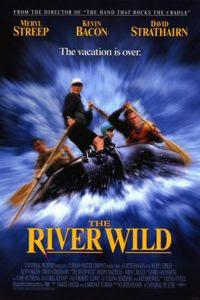 Said fight ensues when sketchy drifter Wade (Kevin Bacon, quite charismatic and scary) and his sidekick Terry (John C. Reilly) attach themselves to the family and demand that Gail get them down the river via a dangerous spread of rapids called "The Gauntlet"; they've just robbed somewhere nearby, and need to get away by a non-traditional route. Bacon's performance as the dangerous and psychopathic but initially likeable Wade is all kinds of fun; Wade first grows close to the family through his attention to young Roarke, but there's an implied attraction between him and Gail as well (at least before he reveals himself as a psycho). Reilly is also effective in his dopey sidekick role, but Bacon really steals the show as the villain you love to hate (and love to picture naked even more). The film seems less impressive after the fact than it does while you're watching. It employs the standard thriller tropes, sometimes effectively, sometimes less so. And there's one rather large plot hole of which I became aware via the IMDB boards. The film sometimes rides the edge of kitch with its made-to-order thriller music, borderline-cartoonish villains, and even a family dog who narrowly escapes being shot by Wade and then returns later to help save the day. But it's really very entertaining nonetheless. I had a great time with this one, as would any fan of Streep, Bacon or rafting. Plus, Meryl Streep gets to hit people with ores. You can't beat that (really, you can't... it's AWESOME). Streep Review: Oh, Meryl, how I love thee. It's the early 90s, you've conquered the world of drama, perfected every accent imaginable, played characters from Denmark, Africa, Australia, England, Poland, and middle America. You've even made successful forays into comedy. But you think oscar may have gotten his fill of you, since you haven't been nominated in (gasp!) four years. So what do you? You go, "f**k it, I wanna be in an ACTION movie!" OK, well maybe she never actually said THAT, but I still love that Meryl decided to dive head-first into the action/suspense/thriller genre. 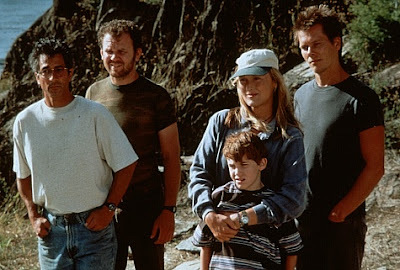 Seeing badass Gail Hartman brave the rapids, beat down her foes with ores, and then cuddle with her young son reminded me of Meryl's old classmate Sigourney Weaver and her fierce maternal love in Aliens (which I just bought on amazon, btw... it was on sale). In fact, someone like Sigourney would seem a more obvious choice for this role (tough-and-fierce-but-always-loving mother), but it was great fun to see Meryl try her hand at it. Her trademark vulnerability and silliness added unexpected layers to the often tough-as-nails Gail.